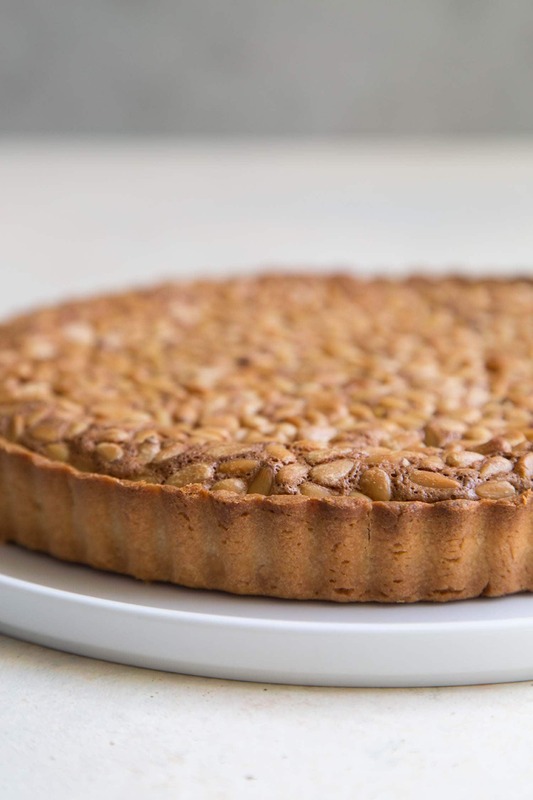 This almond pine nut tart features a crunchy pâté sucrée crust, sweet almond filling, and toasted pine nut topping. Simply serve it with a dusting of powder sugar, or go all out with a scoop of vanilla ice cream! The best kind of desserts have a variety of textures. This tart checks off all the boxes. This dessert features three distinct layers. 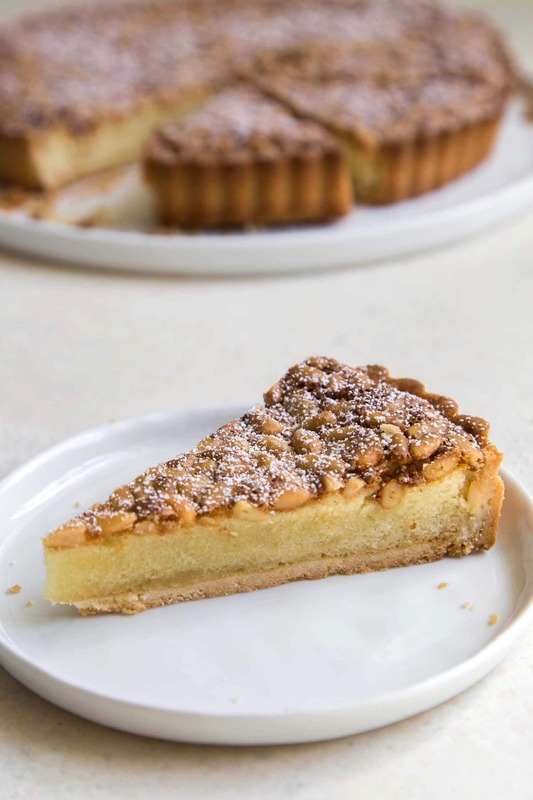 You can clearly see those layers in the almond pine nut tart slice photographed above. There’s a crunchy, crumbly cookie like crust layered with a sponge-like almond filling. And on top, there’s crunchy golden toasted whole pine nuts. Perhaps you’ve seen something similar at a French bakery under the name tarte aux pignons (pine nut tart) or tarte aux pignons et amandes (pine nut and almond tart). It’s basically a French frangipane tart baked with whole pine nuts. This tart is not very sweet. It’s the kind of treat you can enjoy anytime of day, including first thing in the morning for breakfast! It’s important to use a fluted tart pan with a removable bottom. Otherwise, it will be very difficult to unmold the baked tart. The pâté sucrée tart dough is par-baked to ensure it cooked throughout (meaning no soggy bottoms!). Most frangipane filling use pre-made almond pastes, like the case in my nectarine frangipane tart. 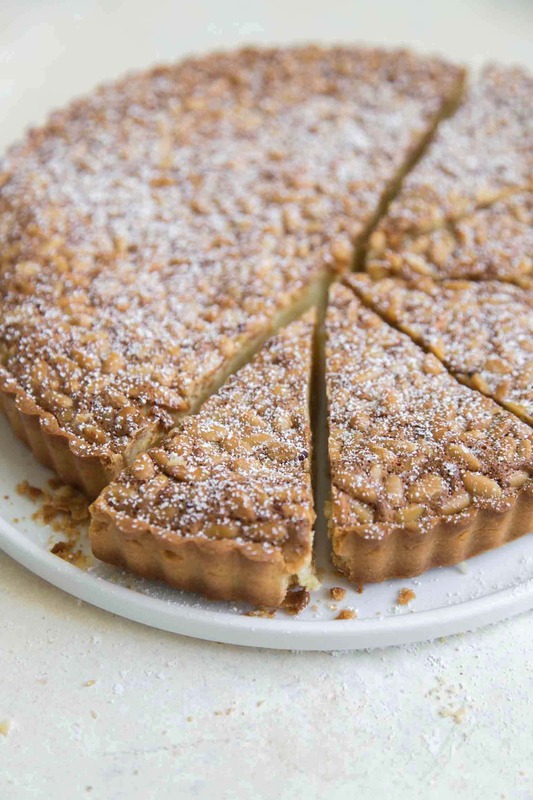 This almond pine nut tart goes a step further. I make my own version of “almond paste” using super fine almond flour, glucose (or light corn syrup), and egg white. Pre-baking, par-baking or blind baking refers to baking an unfilled pastry shell. This is done to prevent a soggy crust one the filling is added. There are two types of blind baking: partial blind baking and full blind bake. The tart shell for this recipe is partially blind baked. Once the dough is in the tart shell pan, it is lightly docked with a fork to prevent the dough from puffing up. For even more protection, the dough is lined with parchment paper (or aluminum foil) and topped with weights. While you could use fancy ceramic pie weights, regular old dried beans work like a charm. Just make sure you use enough weight to fill all the crevices of the tart shell. The dough is baked just until the edges are set and start to pull away from the tart pan. Flavor is transported through oils and fat. Toasting nuts activates the oils trapped within the nuts. This intensifies the flavors, while also improving the texture of the nuts. 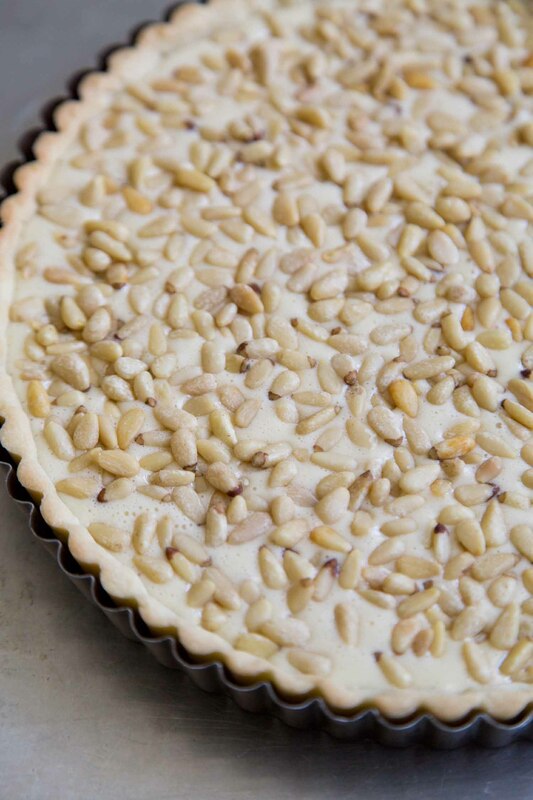 Even though the pine nuts sit atop a moist filling, they’ll remain crisp due to the pre-toasting. Pâté sucrée translates to “sugar dough.” It is a dough usually reserved for sweet pastry recipes. Unlike pie dough in which the butter is cut into the dry flour mixture, this tart dough is mixed together like cookie batter. Softened butter is cream together with sugar and eggs to create a crumbly dough. The dough is very forgiving and easy to roll out. No need to worry about rips or tears when lining the tart shell pan. With pâté sucrée, you can easily patch holes by simply pressing addition dough into the tear. Best of all, pâté sucrée bakes into this rich golden brown crust that’s crumbly and crisp. It’s the kind of dough I wouldn’t mind eating like chips! 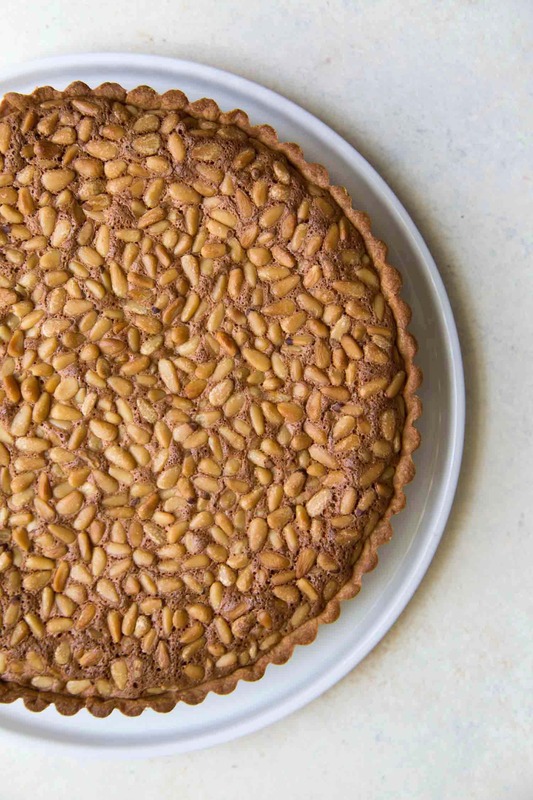 This almond pine nut tart features a crunchy pâté sucrée crust, sweet almond filling, and toasted pine nut topping. In a stand mixer fitted with a paddle attachment, cream together butter and sugar until smooth. Scrape down bowl as needed to ensure thorough mixing. Add egg and egg yolk. Mix until well incorporated. Add flour and salt. Mix on low speed just until there are no longer any dry streaks of flour. The dough will be crumbly. Gently press dough together. Divide in two equal parts and pat into flat discs. Wrap each tightly in plastic wrap and chill for at least 1 hour, or overnight. When ready to roll out dough, place one disc on a lightly floured work surface (or between two sheets of wax paper). Roll into a circle about 11-inches in diameter. Gently transfer dough to tart pan. Use your fingers to press dough against the sides and bottom of pan. Trim the overhang dough along the edges. Sparingly dock the bottom of tart. Cover with plastic wrap and let chill in the fridge while oven preheats. Remove plastic wrap from tart. Line tart with parchment paper or aluminum foil and add pie weights or dried beans. Bake for 8 minutes. Remove parchment paper and pie weights. Bake for another 6 minutes. Remove from oven and allow to cool while you prepare filling. Spread pine nuts in a parchment lined baking sheet. Lightly toast in preheated oven for 5-8 minutes to release oils. Remove from oven and let cool to room temperature. In a food processor fitted with a blade attachment, pulse together almond flour and confectioners' sugar until well combine. Add corn syrup, almond extract, and egg white. Process until smooth and creamy, about 2 minutes. Scrape down the sides and edges as needed to ensure thorough mixing. Add sugar and process until combined. Add eggs one at a time, pulsing until incorporated before adding the next egg. Add flour and pulse until mixture is smooth. Pour mixture into cooled tart shell. Sprinkle cooled pine nuts evenly over filling. Bake for 30-35 minutes until tart crust is rich golden brown and filling is set. Place on wire rack to cool to room temperature. 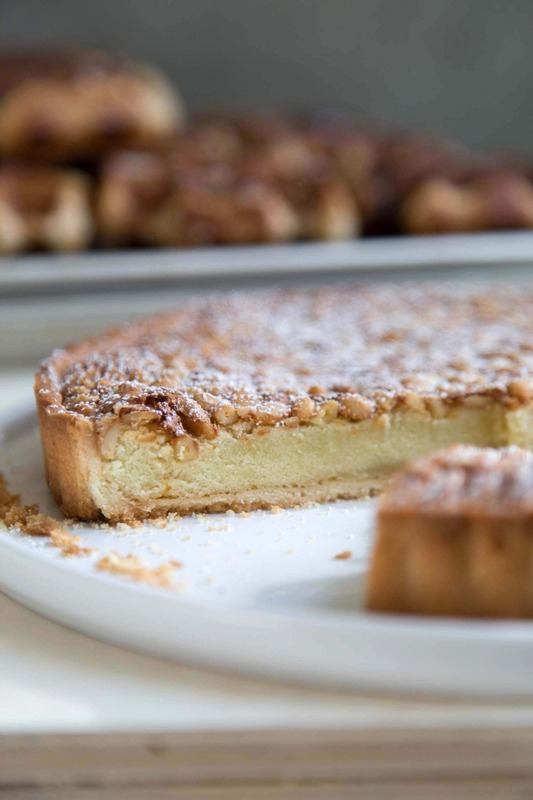 Unmold cooled tart and dust with sifted confectioners' sugar. Slice and serve at room temperature. Tart dough recipe makes enough for two 9.5-inch tart shells. 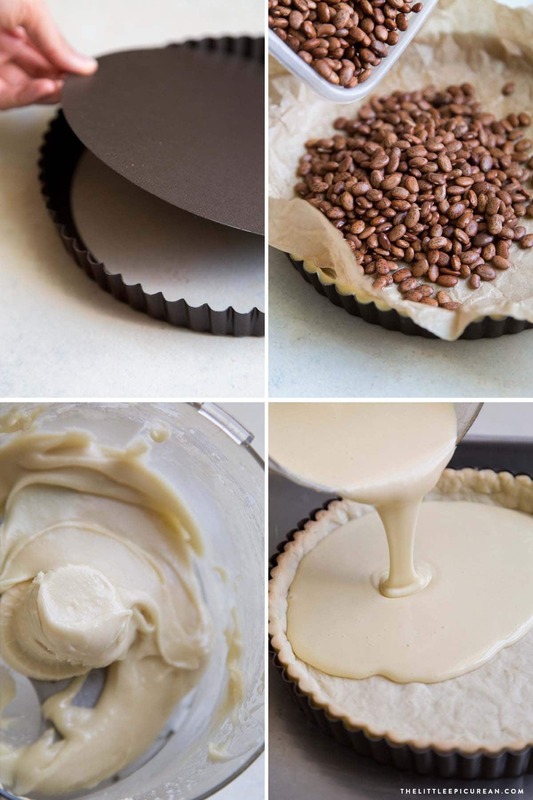 Use second tart dough within three days. For longer storage, wrap tightly and keep in the freezer for up to two months. Thaw in the fridge overnight and use as usual.